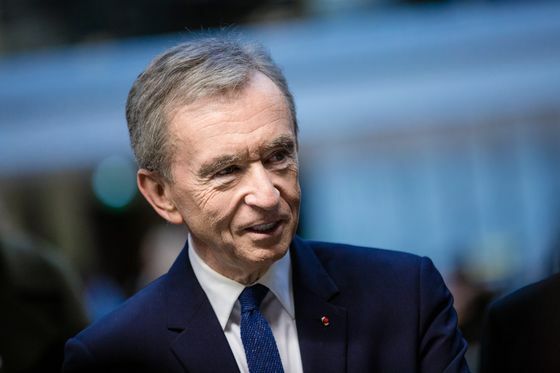 (Bloomberg) -- Bernard Arnault, Europe’s richest man, got another boost as LVMH shares reached a record due to better-than-expected sales of Louis Vuitton handbags and leather goods. The Frenchman, whose fortune has increased by almost $22 billion in 2019, is rubbing shoulders with Bill Gates and Warren Buffett in the Bloomberg Billionaires Index, with a net worth of more than $90 billion. LVMH shares rose 4.6 percent Thursday to 344.95 euros, the highest level since the stock was listed in October 1989, propelling the company’s market value close to $200 billion. The luxury conglomerate’s first-quarter sales report showed its strategy of tapping hip new design talents such as Virgil Abloh has reignited interest in its biggest brands. 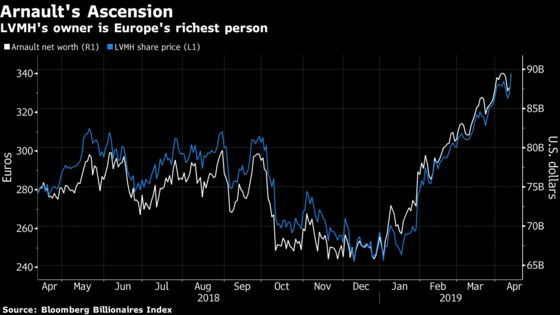 Arnault has been gradually advancing through the ranks of Europe’s billionaires, surpassing Inditex SA founder Amancio Ortega and L’Oreal SA’s Francoise Bettencourt Meyers, the richest woman on the planet. His wealth has again moved past that of Buffett, the Berkshire Hathaway Inc. chairman. Arnault’s rise continues the trend of Europe’s richest people coming from the luxury and consumer-goods sectors. The continent’s wealthiest include the founders and heirs of companies including Chanel SA, Nutella maker Ferrero SpA and EssilorLuxottica SA, the owner of the Ray-Ban brand. LVMH sales beat analysts’ estimates in the first quarter as fresh propositions like Christian Dior monogrammed low-top sneakers and $1,200 Louis Vuitton utility harnesses hit stores. The key fashion and leather division -- where good news often lifts shares across the fashion industry -- posted a 15 percent gain. The luxury industry is now in its third year of rapid growth as millennial and Gen Z shoppers warm up to the revamped offer and newfound digital savvy of brands like Kering SA’s Gucci. The bonanza has been driven by China, where booming sales of high-end fashion have resisted an economic slowdown that pinched revenue for some car manufacturers and Apple Inc.
LVMH’s reshuffle has focused on menswear, with Abloh -- who rose to prominence as the longtime creative consultant to rapper Kanye West -- taking the helm of Louis Vuitton’s menswear division last year. At Christian Dior, designer Kim Jones released buzzy new sneaker models and adapted the brand’s famous Saddlebag line for men. The company said fur-and-handbags label Fendi, shoemaker Berluti, which also changed its designer, and Loro Piana also boosted the fashion division’s growth. The level of growth in fashion and leather “should be enough to sustain the upward momentum of the shares,” Rogerio Fujimori, an analyst at RBC Capital Markets, wrote in a note to clients. Star designer Hedi Slimane, known for his influential skinny silhouette and successful turnaround of Kering’s Saint Laurent, returned to LVMH last year to expand the Celine brand, with plans to add menswear, couture and perfume. His new store concept and first collections, including a line of unisex suiting, were rolled out during the quarter. Overall, LVMH’s first-quarter sales rose 11 percent on an organic basis to 12.5 billion euros ($14.1 billion), the Paris-based company said Wednesday after markets closed. The group -- France’s biggest company by market value -- promised to “reinforce” its leadership position in luxury this year. LVMH’s watch and jewelry division was the slowest growing -- a sign that high-end timepieces are still struggling to make a comeback in a smartphone-equipped world where brands also face mounting competition from online resellers.